Speaker Nancy Pelosi is no stranger to abortion activism. In fact she has won awards for being one of the most strident pro-abortion stalwarts on Capitol Hill. So it comes as no surprise that when her current chief of staff decided to step down that she would replace him with an ardent abortion advocate. Pelosi’s new chief of staff is a former staffer for NARAL. That is one of the most radical pro-abortion groups around as it supports abortions up to birth and wants to force all Americans to fund abortions. House Speaker Nancy Pelosi, the first woman to ever hold that title, will soon have a women as her chief of staff. Her current chief of staff, Danny Weiss, will leave the post on March 25. He’ll be replaced by Terri McCullough, who has worked for years in Pelosi’s office. McCullough started as an intern in Pelosi’s San Francisco office in 1991, and worked for a few non-profit groups before returning to Pelosi’s office. One of those non-profit groups was the abortion advocacy group NARAL. Earlier this year, as Pelosi became Speaker of the House a second time, her first act was promoting abortion. 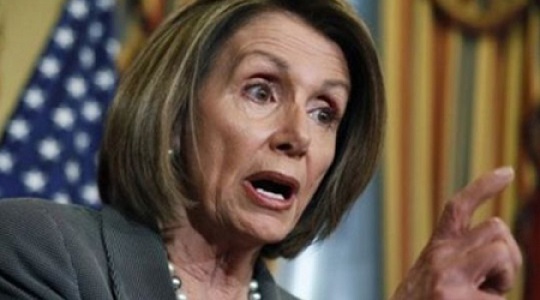 In her first act, the Consolidated Appropriations Act of 2019, Pelosi’s price tag for ending a government shutdown was attempting to repeal the Protecting Life in Global Health Assistance policy (formerly known as the Mexico City policy), and vastly increasing taxpayer funding of the United National Population Fund (UNFPA) which is a chief contributor to China’s appalling policies of forced sterilization and coercive abortion. In essence, Pelosi wanted Trump’s wall on abortion repealed while forcing Americans to finance the international abortion industry. Pelosi’s first priority as the next Speaker was to attempt to force Americans to pay for abortions and to funnel taxpayer dollars to the nation’s biggest abortion business. She wants Americans to be forced to fund Planned Parenthood and its International group’s efforts to promote and perform abortions in other countries. And her State of the Union guest was none other than the head of America’s biggest abortion company. Pelosi has been a faithful politician for the abortion industry, even going so far as to call late-term abortions “sacred ground.” As Speaker of the House, she already has attempted to dismantle the pro-life policies of the Trump Administration and restore cuts that it made to Planned Parenthood and other abortion businesses. In December, she blatantly told RollCall that “women’s reproductive health” – a phrase that means unrestricted abortion up to birth – will be her priority. Ironically, Pelosi surrounded herself with children when she was sworn in as speaker in January. She even chanted, “Go, kids! Go kids!” as she took the gavel. But it’s clear that Pelosi’s priorities are not children, or immigrants or even voters. It’s the abortion industry.